I do own a few 300mm tele-photos over the years. Started with Prakticar Carl Zeiss Jena 300/4, followed by the Contax 300/4 Tele-Tessar. 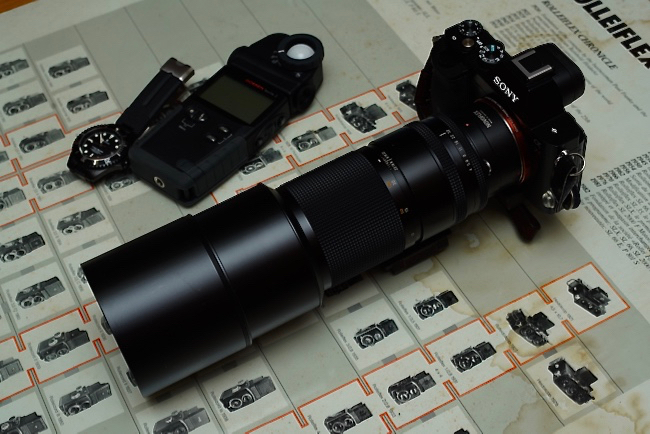 Due to the size, weight and the focal length of the lens, this is a lens that most of the time is kept in the dry cabinet. I use it most of the time bring kids to zoo, or kids having some kind of school event or stage performance. Come to photographing birds, 300mm is a bit inadequate unless it is in the bird park. Also it is not easy to take sharp photos with this focal length. In the film days, with not so good skill like me, it is not easy to take sharp photos with the 300/4 as high shutter speeds are not always possible other than days with very good sun light. High speed films are grainy and not as visually pleasing as ISO 100 film. Of course there were so many skillful wild life photographers able to take fatastic photos of bird and some of them even taken with Kodakchrome 64! Of course I am not one of them and my successful photographs on bird are so limited. It is not until the digital edge things change a bit. Digital sensor high ISO performance is very good even to very high ISO like 1600 or 3200. ISO 400 in digital world can be considered perfect and nothing to be picky about. It is with the digital technology I manage to bring my 300/4 back to life with photos that are at least acceptable to me in terms of sharpness. Also one more thing is the printing technology. Recently my usual print shop changes their printing machine. The first few trials do surprise me that the print quality is quite good, and the print resolution seems better than the old technology and I can see some details taken by my 300/4 that I have not seen before. So I start to photograph birds again, began with easier subjects from the Singapore Jurong Bird Park. After building up confident with the 300/4 Tele-Tessar, I started to work on my Rolleiflex SL66 HFT 500/5.6 Tele-Tessar bought many years back and a newly acquired Nikkor 600/5.6 IF-ED AIS. You know after using these beasts for a while and back to using 300mm it feels so much more manageable. To make sure I get sharp pictures I will try to use shutter speed of 1/500 and sacrifice the ISO for quality. Below the shot I have decided to use 1/250 and to bring down the ISO for better picture quality. The Grey Heron was a very coorporative model and it stayed in that location for quite a while for me to shoot! Other than shutter speed, for the 300/4 Tele-Tessar I would normally try to use at f5.6 to reduce the purple fringing effect which is quite normal for long tele lenses. The below shot was taken at Singapore National Day Parade Rehearsal 2016 under fairly low light at ISO 5000. The print quality at size super 8R was very good and I am quite happy with the results. Another example of the beauty of high ISO quality on digital media. The White Tiger below was photographed at ISO 10000 due to very bad weather, but the rain stopped for a while for me to take this photo. The equipment was resting on a railing and it was quite stable and as good if not better than tripod. I like your pictures so much ! My opinion is the old design of this TT lens with its average performance brings challenge when partners with A7RII. You may consider to get a N TAT400/4 and the Fringer adapter if you like shooting at this range. Thanks for your suggestion. Ah Wah did suggested the same thing to me before. Despite the average performance of 300/4 (on paper at least), at 8R print out actually the performance is quite impressive, of course when do close up crop on computer you will see many short comings.